Start by dicing up the baked chicken breast. Set aside until needed. To make the corn, start by making the seasoned ghee to spread over the cob. Take 1 Tbsp of ghee and combine it with the paprika, cumin and garlic powder. Mix together to incorporate the spices evenly. Spread the spiced ghee all over the corn and grill. Once the corn is cooked, set aside to cool. Once cooled, slice the kernels off of the cob and set aside until needed. Now, take the diced chicken breast and flash fry it over medium-high heat with 2 tsp of coconut oil and 1 tsp of the Mexican spice mix, until golden in color. (about 1-2 minutes). 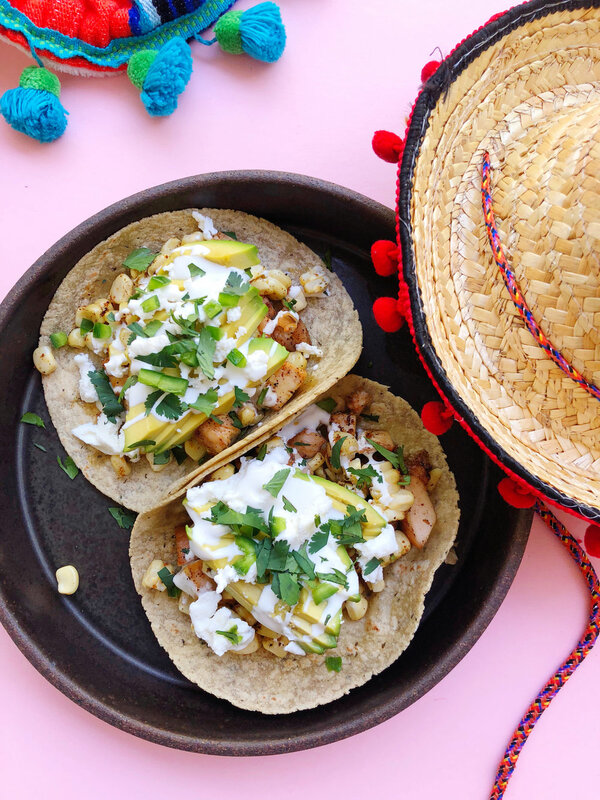 To assemble, place 1/2 of the pan fried chicken on top of each tortilla and top equally with the chard spiced corn kernels. Next, place thinly sliced avocados (1/2 an avocado per taco) over the corn and top with 1/2 tsp of Mexican crema and 1/2 Tbsp of fetta cheese over each taco. Lastly, garnish with 1/2 tsp of the diced jalapeno on each taco and a last seasoning of Kosher salt and freshly cracked pepper. About 1/8 tsp each. Start by preparing the steak. Bring the meat up to room temperature before seasoning the beef. Next, pat the filet down with a paper towel and heavily season both sides with salt and pepper. Now, heat up 1 Tbsp of ghee over medium-high heat and sear the steak on both sides. About 1-2 minutes per side. Once both sides have been seared and are golden brown in color, set aside on the cutting board to cool for 5 minutes. While the steak is cooling down prepare the arugula by tossing it with basil oil, salt and pepper. Once cooled, dice the filet. Now return the steak to the pan, you may need to add 1-2 tsp more of the ghee if you are low, and flash fry the steak over med-high heat for another 1-2 minutes, or until golden all over. To assemble the tacos, divide the arugula and steak equally and place on top of the toasted tortillas in that order. Next, drizzle 1 Tbsp of tahini dressing over each taco and garnish with watermelon radish and a squeeze of lime juice. Finish it off with a last seasoning of salt and pepper. (1/8 tsp of each per taco). Start by brushing the top of the salmon fillet with olive oil and seasoning it with coarse kosher salt and freshly cracked black pepper. Next, bake your Salmon fillet in the oven at 350 degrees for 18 minutes. Once cooked, break apart with a fork and set aside until needed. Now to make the slaw, you will need to thinly slice the two kinds of cabbage and place them in a bowl with 2 tsp of both the ginger and miso dressings. Next, season the cabbage with salt and pepper, and toss to combine. Now toast the corn tortillas. To assemble the taco, place the cabbage slaw equally on top of both the toasted tortillas and then top with the baked salmon fillet. Next, top each taco with a Tbsp of the sauerkraut salad and a few mustard flowers for garnish. Finish it of with a last seasoning of salt and pepper, just a pinch (1/8 tsp of each per taco).